The Quezon Judges Association in partnership with the Provincial Government of Quezon headed by Gov. 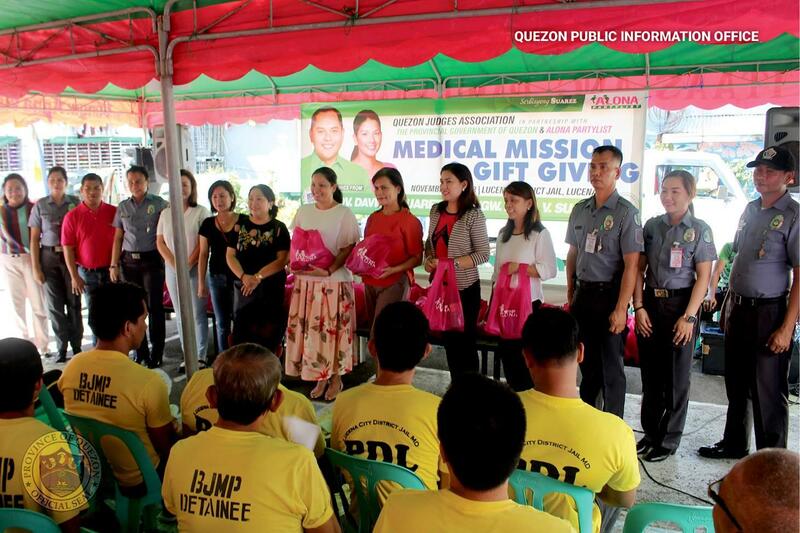 David C. Suarez and Alona Partylist has further strengthened its holistic programs that would improve the conditions of our fellow deprived of liberty at the Bureau of Jail Management and Penology (BJMP)- Lucena District Jail, Lucena City through the recently conducted Medical Mission and Gift Giving, November 29, 2018. The activity gave various health care services that catered to the needs of a total of 50 inmates like medical and dermatological consultations with the support of the Doctors from the Quezon Medical Center and staff from the Integrated Provincial Health office and Provincial Government. Said worthwhile programs are part of the Provincial Governments initiatives and sincere efforts to make difference and bring hope even to those who have fallen astray in their lives. Aside from the free medical consultations, internees were also given free medicines and free hygiene kits. In response, the inmates thanked the Provincial Government through a series of song and dance numbers. Alona Partylist Representative Congw. Anna Villaraza-Suarez said that they will continuously uplift the spirits of the internees through this kind of services and by showing compassion not just for them but also to their families.